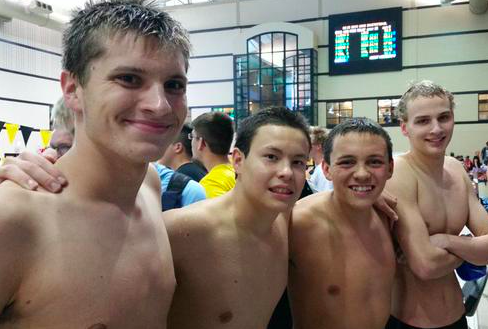 This past weekend the boys swim team competed at a swim meet in Columbia, MO. The team went into this meet with confidence. “This is the best team we have had in several years. We have the best freshman class in the history of our program. Freshmen Noah Witzki, Cameron Murphy, and Sam Coday all have individual state qualifying times and Witzki and Murphy are both less than a second off of school records. Between them, Witzki and Murphy have set 6 freshmen records. Senior Joe Saitta has also qualified for state and senior Alex Goerke is getting close. We have also qualified all three of our relays for the state meet which is great for this early in the season,” coach Chris Murphy said. Unfortunately there was a scare of cryptosporidium at the community center where the team practices and they spent a few days out of the water. The virus affected no one on the team. “Luckily we were back in the pool after missing a couple days a few weeks ago,” Murphy said. Freshman Noah Witzki placed sixth in the 100-yard butterfly, and seventh in 100-yard backstroke. He also qualified for the state meet in those two events as well as 100-yard freestyle, fifty-yard freestyle and 200-yard IM. Witzki is close to breaking numerous school records and currently holds a few freshmen records. “It really does take hard work, honestly. It’s something that didn’t come overnight, it took me a long time to work to this point, it takes a long time for almost anyone to get to this point. State would be fun to go as a team trip, but just to go to State is fine enough,” freshman Noah Witzki said. Freshman Cameron Murphy took fourth in the 500-yard freestyle and twelfth in the 200-.yard freestyle. Murphy is also close to breaking school records, and has made many freshman records. The relay team of senior Alex Goerke, freshmen Sam Coday, Noah Witzki and Cameron Murphy placed tenth in the 200-yard freestyle relay, and eleventh in the 400-yard freestyle relay. “I hope to get my own individual state cuts, instead of like last year where I just had the relay. We have a good chance of making finals, which we didn’t do last year we missed it barely, so I’m excited to hopefully swim at finals this year,” senior Alex Goerke said. LHS is looking forward to many of the swimmers competing at the State swim meet in November including, senior Joe Saitta in the 100-yard butterfly, who qualified with a time of 54.49 seconds, freshman Sam Coday in the 500-yard freestyle, who qualified with a time of 5:01.47, freshman Cameron Murphy in the 500-yard freestyle and 200-yard freestyle, with qualifying times of 4:49.35 and 1:49.50, respectively. The team will also send three relays to state consisting of Witzki, Saitta, Murphy and Coday in the 200-yard freestyle relay qualifying with a time of 1:33.45, Witzki, Lowery, Saitta and Coday in the 200-yard medley relay with a qualifying time of 1:44.51 and Murphy, Goerke, Saitta and Witzki in the 400-yard freestyle relay qualifying with a time of 3:25.55. Good luck Jays.